Current day volcanology largely tends to an instrumentalist view of art as, in its mimetic form, capable of providing proxy data on the timing and unfolding of particular volcanic events and, in its impressionistic form, of conveying the sublime grandeur of volcanic events and scenes. In this chapter, we note that such a reductionist view of what science is unhelpfully glosses over a much more complex disciplinary lineage, wherein both art and aesthetics played a key role in knowledge production concerning volcanoes. Using the work of Sir William Hamilton and Mary Somerville as case studies, we emphasise that art and aesthetics were part and parcel of both an 18th and 19th century approach to the study of volcanoes, and the making of particular scientific audiences. What is more, it is this lineage that provides a creative reservoir for more recent efforts that cut across scientific and arts divides, such that the ‘communication’ of the nature of volcanoes becomes a multi-media, multi-affective endeavour that speaks to a diverse range of publics. As many of the authors in this edited collection attest, communication is an embodied practice that serves to impart information, allowed for by sensory and cognitive modes of knowledge making. These modes are biologically as well as socially embedded, framing and valuing particular ways of knowing (or epistemologies) that tell us how to ‘see’ the world; they operate to sustain or frustrate power relations between and amongst people and things, mobilising a range of affective relations and emotions. 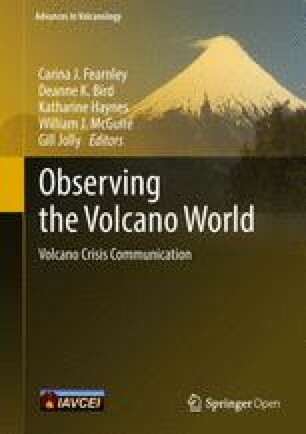 In this chapter, we bear this expanded notion of communication in mind as we outline something of the history of how a knowledge of volcanoes was produced and disseminated during the 18th and 19th centuries—a crucial period during which volcanology was to became a modern-day scientific enterprise. As we go on to outline below, this making modern of a discipline was predicated on a shift in the way in which knowledge was collected and disseminated. A combination of institutional entities, theoretical frameworks and methodological devices (Good 2000) led to a reorganising of scientific communities and audiences, but also the process through which scientific practice was undertaken. In the 18th century we could still observe a Renaissance ‘truth-to-nature’ approach to knowledge gathering that made little separation between science and art. Where the artist provided a means of accurately observing and capturing the complexity of a physical scene, the scientist’s finer ‘touch’ teased out details that escaped such vistas. Complementary to each other, these efforts not only allowed for the production of knowledge concerning the realities of Nature, but its particular mode of dissemination, such as the exchange of letters and sketches, as well as interesting objects, via scientific societies. Many scientific artefacts, representations and antiquities emerged from the expeditions embarked upon across Europe, and particularly the Mediterranean, by scientists such as Sir William Hamilton (1730–1803). Field-walking in the volcanic landscapes of central and southern Italy provided him the grounded knowledge required to recreate volcanic environments in the form of textual and visual illustrations, providing a mechanism though which to report the knowledge upon which volcanology is now largely predicated (Schnapp 2000; Vaccari 2008). In the 19th century, however, we can discern more of an emphasis upon a systematised description and explanation of natural phenomena that glossed over the individualised and embodied presence of the scientist. Mary Somerville’s (1780–1872) letters, for example, remained testament to the visceral impact of volcanic landscapes, but her textbooks—Physical Geography (1854) and On the Connexion of the Physical Sciences (1858)—conveyed more of a Gods-eye view of the cause-effect processes at work. The cultivation of a mechanical mode of objectivity reworked the communication of scientific knowledge more broadly, as indicators of the imaginative work of the scientist were erased from the writing up process (as observed in the emergence of the passive tense, for example, and the valuing of a prescriptive report template), but also in image-making. As the now iconic article by Daston and Galison (1992) makes clear, there was to emerge a polarisation of the personae of the artist and the scientist; ideals of actuality, accuracy and credibility had begun to be set apart from the imaginative, descriptive realms of the arts and humanities (Sigurdsson 1999). As the 21st century unfolds, however, we are witness to more inter-disciplinary collaborations that do not so much ‘bridge’ the arts and sciences divide, as worry at their differences, and, often times, look back into the history of both for inspiration. Such a history is of interest in and of itself insofar as it reveals the often overlooked yet crucial role of not only sensory (or aesthetic) experience in the making of a knowledge of volcanoes, but of artistic practices also. The latter not only provided for the dissemination of a visual literacy concerning volcanic forms and attributes, but also facilitated a scientific curiosity and wonder. As Atkinson (1998) remarks, the ‘scientific approach’ that is so often taken for granted today as a common sense, seamless mode of knowledge production belies a rich, often tension-ridden heritage of ‘science in the making,’ as various tropes and techniques emerged and became standardised at the expense of others. The adventures of Hamilton and Somerville were not the exception, but instead typify modes of scientific exploration and knowledge discovery of the 18th and 19th centuries within the field of volcanology, each helping to shape ‘a new science of mankind’ (Schnapp 2000: 123). The explorations of Hamilton and Somerville thus offer insights into the role of aesthetics and art in volcanic communication, and the nature of volcanology as a science (Sigurdsson 1999; Von Der Thüsen 2003). Throughout the 20th and 21st centuries, these mechanisms of representing volcanic landscapes have been further transformed, notably through the rise and expansion of cyber and digital technologies. Epistemically, the making of knowledge has used the middle-ground between art and science to garner and further the immersive, virtual and multi-perspectival exploration of the landscapes that Hamilton and Somerville previously conveyed. In what follows, we illustrate, through the expeditions of Hamilton and Somerville, how aesthetics (in the form of an embodied, sensuous encounter with Nature) and art (in the form of imaginative visualisations of Nature), were a crucial part of knowledge-making within volcanology. Firstly, we outline the work of Hamilton, and his emphasis upon diligent observation in the field, made possible via the sensibilities of an educated elite. Next, we turn to Somerville’s output, which encompasses her representations of volcanic environments in the form of letters, but which also notes the significance of the new literary space created by the scientific textbook. With this history in mind, we go on to outline something of the contemporary movement to collaborate across art and science, on the subject of volcanoes, drawing out how their aesthetics allow pause for thought on the hesitancies and complexities of volcanic science itself, as well as the manner in which key concepts such as ‘deep time’ become sedimented in broader understandings of human-environment relations (Wilkinson 2005). Over the course of the 18th century a plethora of what Edmund Burke (see Phillips 2008) was to refer to, in his classic texts of 1770 and 1796, as ‘sublime’ landscapes—that is, capable of producing awe and even terror in the observer—were to be configured not simply as visceral experiences, but also as complex scenes that could be described and even explained by virtue of a close attentiveness to both their sweep and their detail. These landscapes were encountered in the rural margins of Europe, as well as the newly colonised lands of America and Austral-Asia, by discerning, wealthy visitors who, cognizant of philosophical discussions on the role of the intellect in making sense of sensual phenomena, as well as rapidly developing techniques of recording and mapping physical phenomena, viewed themselves as having the subtle imagination necessary to appreciate what lay before them. Most of the British visitors to the Continent were preoccupied with the ‘Grand Tour’ and the cultivation of a sense of cultural superiority through travel, but some, such as Sir William Hamilton (the British Envoy to the Spanish Court at Naples, 1764–1800), were on official, diplomatic business, and took the opportunity to enhance their residence abroad by reporting on the scientific value of nearby landscapes, such as the volcanic landscapes of Vesuvius, to an organised scientific community (Ramage 1990; Vaccari 2008). One of the key nodes of scientific knowledge making at this time was the Royal Society (or, ‘The President, Council, and Fellows of the Royal Society of London for Improving Natural Knowledge’), established in 1660 following a charter by King Charles II, and granted funds from Parliament in return for providing the government scientific advice on a wide variety of subjects. Inspired by the empiricism of Baconian science, the Royal Society was constituted by wealthy gentlemen interested in experimentation and detailed observation as a means of grasping the natural laws that underlay the human condition, as well as the universe at large (Atkinson 1998); research that was published in regular editions of the Philosophical Transactions of the Royal Society (1675 onwards), distributed to fee-paying members. These articles were in turn constituted in large part from letters sent to the society’s headquarters, and read aloud to an audience that could also include interested non-members. These missives imparted content, to be sure, but in a format that made clear that this was an exchange of ideas between colleagues; a communicative procedure that expressed the immediacy of a face-to-face conversation, and even the rhythm and tone of the spoken word, even as it made clear the often immense physical separation between author and audience (Redford 1986). Often, they were accompanied by objects of interest, such as mineralogical displays or fossils, that provided a tangible focus for the play of intellectual curiosity (Da Costa 2002). Such letters were by far the most important medium for the production of scientific knowledge in the 18th century. In the context of the Royal Society, these letters made clear an intellectual curiosity on behalf of the scientist, but also a rendering of scientific practice as a moral as well as instrumental enterprise, characterised by diligence, a discerning judgement, and skilled workmanship (Sorrenson 1996). It is these qualities that ensured the production of accurate, ‘true-to-nature’ observations. Crucially, these observations were achieved not by erasing either the individuality or situatedness of the scientist, nor by imagining the body of the scientist as somehow separate from Nature, but via the careful cultivation of one’s immersion in Nature. The experiments that scientists conducted were as much a matter of a mannered sensibility, then, as the correspondence via which they were reported. This careful cultivation of a scientific aesthetic—by which is meant a sensuous as well as cognitive engagement with Nature—can be clearly discerned in the work of Hamilton, one of the most famous early correspondents on volcanic landscapes, and whose communications so neatly befitted the mannerism of social attitudes towards science at the time. Hamilton was elected a Fellow of the Royal Society in 1766; a long-distance membership that complemented his antiquarian interests, as well as his curiosity concerning the forces that shaped the Earth’s surface over substantial periods of geologic time. Contemporaneous explorations of Pompeii and Herculaneum had, of course, stimulated interest in the Classics, but had also raised the issue of the formative role of volcanoes, and in particular the vexing question of where the vast heat sources needed for eruption were located. Were these deep underground, or much closer to the summit? Such a question was in turn situated within a rapidly unfolding earth science that, whilst it left the origins of the Earth to religion, nevertheless sought to describe and analyse mountains in terms of an internal examination of the lithology and the fossil content of rocks, the geomorphology of an area (as read though its dips and inclines, for example), and of geologic strata as providing a chronology of the Earth’s formation. With a house in the foothills of Vesuvius, as well as a residence in Naples, Hamilton was to explore this volcano’s craters and associated features time and again, all the while collecting antiques and landscape paintings as well as local gemstones and geological samples (Sleep 1969; Ramage 1990). Letters recounting his experiences were read at weekly meetings in London, where the audience could peruse the paintings, sketches, lava and soil samples that Hamilton had also sent over. Some of these images were adapted and published alongside the letters in Philosophical Transactions. For Hamilton, such images of the landscape, as well as tangible objects collected from them, were very much a key component of knowledge making. That is, these did not simply capture the interest of others, but were able to sensually convey, in a visual, material form, something of the eye witness, aesthetic experience he himself had cultivated. Hamilton’s production in 1776 of the richly illustrated folio collection of letters, Campi Phlegraei: observations on the volcanos of the two Sicilies, is testament to this desire to more fully immerse interested observers in volcanic landscapes, as well as to inform them of his own commentaries. A sensuous engagement with landscape, via the cultivated senses, was a far superior route to knowledge, he wrote, than “systems, which other ingenious and learned men, have perhaps formed in their closets, with as little foundation of felt experience.” These were likely to “heap error upon error” (p. 5). Though Hamilton was well aware of the visceral effect of such scenes, as well as the emotions raised by a consideration of how past towns and villages had suffered, he did not consider these to be sublime in the sense that they indicated an awesome, indifferent Nature, as Kant would have it. Neither did Hamilton emphasise the overpowering forces of Nature in the manner of Burke’s narrative on the sublime (1770, 1796), which unnervingly depicted the ease with which Nature could strike. Instead, Hamilton harkened to a more traditional view of Nature, whereby such tumultuous episodes were yet part of a fundamentally harmonious relationship between environment and society. “There is no doubt, but that the neighbourhood of an active Volcano, must suffer from time to time the most dire calamities, the natural attendants of earthquakes, and eruptions…,” he wrote, “But to consider such misfortunes, on the great scale of nature, it was no more than the chance or ill fate of those cities to have stood in the line of its operations; intended perhaps for some wise purpose, and the benefit of future generations” (p. 3–4) including, he noted, rich soils for agriculture. Readers could view the separate volumes of plates and letters in parallel. Thus integrated, Campi Phlegraei’s literary and visual technologies contributed simultaneously to achieving a more complete witnessing experience… Whereas the pictures in Philosophical Transactions had depicted only distant eruptions, Campi Phlegraei’s plates had more varied subject matter. Many placed foreground human figures in specific, visible relationships with the landscape, dramatizing the practices embodied by the book. People positioned on the mountainside stressed direct interaction with nature, while those absorbed in concentrated thought demonstrated focused attention… Using colour, lighting and pose, these plates also distinguished visually the rational behaviour of curious aristocrats from the captivated fear and wonder of awe-struck peasants… His final plates depicted examples of volcanic matter in remarkable detail, using trompe l’oeil techniques that invited beholders to inspect the images just as they would specimens in a collector’s cabinet (2006, p. 90–91). Though the importance of witnessing phenomena first-hand, and of accurately describing them, was to remain a pivotal objective of scientific practice into the 19th century, we can also track a gradual erasure of the sensuous, embodied presence of the scientist from the communicative process, and a simultaneous celebration of the intellect as a means of synthesising information and organising it into a comprehensible whole for others. In the work of Mary Somerville, we can discern the first major English-language effort to create such a ‘modern’ synthesis for a rapidly evolving geographic discipline, one that strove to distinguish its practitioners as experts in human-environment relations, but was yet populated by academics whose research, like Somerville’s, extended across what we now think of as the sciences and arts. Despite a highly gendered academic and social environment, Somerville was able to make use of personal networks in both an ‘Enlightened’ Edinburgh and Paris, and the Royal Society (of which her second husband was a member) to further her research into mathematics, astronomy and geology, but also to practice painting and Greek (see Patterson 1974). She was elected honorary membership of Société de Physique et d’Histoire Naturelle de Genève, and the Royal Irish Academy in 1834, was a member of the Royal Astronomical Society in 1835. She went on to be elected to the American Geographical and Statistical Society in 1857, and the Italian Geographical Society in 1870, receiving the Victoria Gold Medal of the Royal Geographical Society that same year. Like many of her British contemporaries, Somerville thus straddled two worlds, and thrived upon contestation; on the one hand, she was the product of what was becoming known as a scientific ‘amateurism’ characterised by self-funded and self-governed scientific assemblies; on the other hand, her expertise was formally recognised by the ‘professional,’ continental scientific circles residing in university departments and granted stature through a promotion and awards system. Mary Somerville moved to Rome for her husband’s health in 1838, where she began work on the two-volume Physical Geography (1858). She lived in Italy until her death, travelling throughout the country and maintaining a travel diary as well as correspondence with scientists across Europe, and family; some of these are collected in Somerville’s Personal Recollections (1874). These documents recorded her descent into the crater of Vesuvius in 1818, and her witnessing of the April 1872 eruption. And, in them can be discerned her interest in the Earth as a dynamic planetary body, but also of the aesthetic, visceral impact of volcanic processes. That is, Somerville is at pains to convey the first-hand experience of the field, noting scenery, sounds, smells and even the touch of the landscape. Somerville uses the power of the textual narrative to initiate the reader’s senses and, in due course, educate the reader on the characteristics and processes of the natural, geomorphological environment. Many times within the text her tone is scenic, reflecting her painterly eye; she notes, for example, “We have bright sun-shine with bitterly cold wind and frost, Vesuvius has been powdered with snow but still sends out vapour” (January 1869). During the 1872 eruption of Vesuvius, however, Somerville’s description becomes more visceral and sublime. Somerville’s account is geared more towards the awe-inspiring nature of volcanoes, rendered in terms of their cataclysmic impacts, and their colouring of landscapes as gloomy and risk-ridden. “On Sunday, 28th,” she wrote, “I was surprised at the extreme darkness … the fall was a little less dense during the day, but at night it was worse than ever … certainly the constant loud roaring of Vesuvius was appalling enough amidst the darkness and gloom of the falling ashes” (1874, p. 369). “In sunshine the contrast was beautiful,” she continued, “between the jet-black smoke and the silvery-white clouds of vapour … At length, the mountain returned to apparent tranquillity, though the violent detonations occasionally heard gave warning that the calm might not last long” (1874, p. 125). Somerville’s observations may well be read as resonating with a Kantian notion of how particular, complex landscapes produced particular responses in observers, as manifest in his (1764) text Observations on the feeling of the Beautiful and Sublime; certainly, Somerville’s incorporation of the knowledge gained through her field experiences in her text books implies a similar celebration of the human intellect in making sense of such states. As Fara (2008: 83) observes, “Somerville conveyed to wide Victorian audiences not only the impact of the latest scientific discoveries, but also the sublime thrill of engaging with cosmological mysteries”. Somerville’s text Physical Geography, however, is perhaps more usefully regarded as a ‘Humboldtian’ mode of knowledge production—after the geographer Alexander Von Humboldt, with whom she corresponded—whose work strove to present the fundamentally harmonious nature of the Kosmos, and the need to combine mathematical precision in recording processes with an aesthetically-sensitive recognition of their role in creating distinct landscapes (Dixon et al. 2012). Somerville’s turn towards the aggregation of facts, scientific truths, relationality and the processual structure of systems emphasised knowledge as a matter of bringing together seemingly disparate elements, and of explaining their import in terms that were accessible to a large audience. Importantly also, and contra the work of Hamilton and the Royal Society, such knowledge, she argued, must needs be “widely diffused amongst all ranks of society” (1854: 395). At times, this mode of communication is achieved through the use of analogy, as when, “An internal expansive force acts upwards upon a single point in the earth’s crust, the splits or cracks must all diverge from that point like radii in a circle, which is exactly the case in many volcanic districts” (Physical Geography, 1854, p. 46). Here, the embodied perspective of the scientist has been replaced by an ‘objective’ Gods-eye view—facilitated by reference to the ‘pure’ language of geometry—that relates the universal ‘fact’ of what a process consists of and does. Elsewhere, Somerville relies on recreating, with emotion-laden rhetoric, a visual spectacle for the edification of the reader, such that, “The desolation of this dreary waste, boundless to the eye as the ocean, is terrific and sublime …” (1854, p. 91), while, “The chasms yawning into dark unknown depths, strike the imagination …” (1854, p. 103). Here, the reader is one with the scientist, both immersed in the experience of a volcanic eruption. Though she did not credit herself (as an intellectual woman) with the capacity for originality (see Creese 1998: 204), Somerville’s work firmly argued for volcanology as an inter-disciplinary endeavour, belonging to the Natural and Earth Sciences. What is more, these sciences were understood as having an explicit aesthetic dimension, whereby a sensuous engagement with Nature lent itself to, and certainly did not preclude, an understanding of the cause-effect relations behind particular events. There is no doubting that the emergence of scientific textbooks such as Physical Geography has become a key means of democratising knowledge (Grinstein 1987), somewhat distancing Somerville’s methods from those of Hamilton. Indeed, for Richard Holmes (2014), Somerville’s On the connexion of the physical sciences plays a crucial role in ushering in the textbook as a means of popular education about the world. They have also, it must be added, facilitated in the process a translation of information into what Neeley (2001) terms a ‘general enlightenment,’ whereby a clear, logical rhetoric—which, of course, developed out of a particular place and time—is used to synthesise knowledge, narrowing it down to a simple, coherent ‘message’ that prevents contradictions. The structure, linguistics and content of such textbooks articulated a more holistic view of science, transforming, rather than connecting with, the attitudes and expectations of a society that had previously revelled in a plethora of sensuous, sublime and wondrous narratives. The writing of such textbooks both presumes and reproduces a replicable literary space wherein this message remains, hopefully, consistent across context, regardless of who the reader is, or of what the format of the book itself looks like. For much of the Earth Sciences, today, the purity of the ‘message’ promised by the mass media textbook is matched by the ‘objectivity’ of data produced through field-based research. To be sure, observing in the field remains a crucial part of Earth Science training; but, this is now rigidly systematized as the technologically enhanced, error-free measurement and recording of variables. Such aesthetic encounters, in effect, allow for the production of data. On occasion, an interest in art can still be discerned. But, such works are valued because they presumably ‘capture’ something of the ‘real’ world nature of events. A key example of this instrumental approach is Zerefos et al.’s (2007) reconstruction of past aerosol optical depth, before, during and after major volcanic eruptions, using as data proxies the coloration of the atmosphere in 500 paintings that depicted sunsets between 1500 and 1900. They note that the artists under study “appear to have simulated the colours of nature with a remarkably precise coloration”, and conclude that their study provides a “basis for more research that can be done on environmental information content in art paintings” (p. 4033). The fundamental separation of art and science posited here can also be found, it must be noted, in numerous art statements and curated exhibitions. The recent major retrospective Volcano: Turner to Warhol, held in 2010 at the Compton Verney Gallery, for example, juxtaposed iconic and new art works that emphasise the ‘mystery’ of these phenomena with the comments of volcanologists, the latter pointing out the ‘realities’ of the processes at work. It is while ‘waiting’ for the eruption, which sometimes does not happen, that observers are presented with the complexity of natural disasters, as well as the challenges faced by those who predict natural hazards (2012, p. 12). A key concern here is not to present the work as an ‘alternative’ form of science communication concerning environmental risk—one that has public appeal because of its spectacular imagery. Rather, the intent is to convey a state of anticipation and anxiety that cuts across scientific and artistic cohorts, and extends to the public at large; while these motions may well be experienced in singular fashion, there is yet a shared awareness of the affective capacity of such earth shuddering events. In the North of Iceland along the Mid-Atlantic Ridge, two newlyweds move into their first house. They are very excited - new house/new life. No one tells them when they move into the house that it sits on a fault line. There is a massive volcanic eruption followed by an earthquake. Their house splits in two. Their living room has a huge gash straight through it. They are horrified—devastated. What does this mean? Their house is destroyed. Their marriage had only just begun, and the chasm running through their marital bed does not bode well for their future. They realise that actually, the house has a clean break down the middle, and instead of devastation it could be a sign for something much better. They build a new room in the space of the gap, transforming a potentially catastrophic situation into an expanded living space. Integrating catastrophe (www.ilanahalperin.com/new/integrating_catastrophe.html, 2014). Subsequent works, which are undertaken in the field alongside mineralogists, geologists, and archaeologists as well as volcanologists, explore what Halperin terms a ‘geologic intimacy’ (www.ilanahalperin.com/new/statement, 2014); a project that very much resonates with efforts in human geography to map out a more elementally-aware ‘post-humanism’ that no longer equates agency with human will. There is no doubt that art has the capacity to heighten an audience’s awareness of the emotional connections drawn between humans and their volcanic environments (Sigurdsson 1999). What seems to be stimulating more recent works, however, is a fascination with how scientific notions of a ‘deep time’ (Wilkinson 2005) provide a contrast with more avowedly social temporalities, from policy time-frames to anniversaries, but also help call into question how these same temporalities are themselves interwoven with a more elemental Earth History. As the process of representing volcanic environments has delved into virtual and digital worlds, the rise of the internet has drastically transformed the relationship that society has with such landscapes and their temporalities. The generation and exploitation of social media sites, together with the rise of applications such as Google Earth, allows the audience a new sense of wonder, whereby they can ‘journey’ through volcanic worlds in real-time. A stark contrast with the texts of Somerville, and the emotive imagery of Halperin, emerging screen-based practices transform the positionality of the traveller, engaging them in a manner that asserts them as an end-user, able to control the pace and prowess of their own movement from the domestic or enclosed space within which they are situated into a mobile, fluid and data-dense virtual field. It is within this multi-faceted spectrum field of vision/action that a new, affective envisioning of volcanic environments can be explored, shaped and interrogated. Collectively, the communicative mediums outlined above provide what Wise (2006) calls a ‘materialized epistemology,’ by which he means that these are not simply the end-products of a scientific project, but are themselves an essential part of ‘doing’ the work of knowledge production. And, in drawing out particular examples, we can discern a key shift in how aesthetics, and art, have been considered a part of, and indeed outside of, scientific practice (Sigurdsson 1999). That is, in the 18th century, aesthetics are actually key to the emergence of an observant science, one that makes explicit the role of gentlemanly sensibilities in making sense of Nature. By the turn of the 20th century, however, such an embodied practice has come under suspicion as prone to bias and error; in its place, we see an unfolding God’s Eye view of Nature that promises to provide a pure, unsullied message that remains constant across audiences and mediums. With the onset of the 21st century, however, we can also discern something of a retrospective approach to volcanic communication. This art-science movement is by no means restricted to an educated elite—indeed, a variety of audiences are envisioned—but it does seriously re-engage with aesthetics a means of creating and building knowledges concerning volcanoes. The question emerges, however, as to the value and relevance of such collaborative efforts. On the one hand, there is no doubt that these are receiving greater prominence, and funding, in light of the pervasive argument that environmental problems, including volcanic hazards, are ‘wicked,’ such that the expertise of several disciplines must needs be brought to bear in their analysis. Critiques of a modern-day ‘silo-thinking,’ for example, can be found across the UK’s physical, engineering, social science and arts-focused Research Councils, as well as an ensuing presumption that solutions lie in ‘bridging’ such divides. On the other hand, there is also an intellectual impetus at work here. That is, we can also discern what is usefully described as a ‘transdisciplinary’ effort that seeks out otherwise abandoned and dismissed histories—such as an Earth Science aesthetic—and reanimates these as a means of creating ‘new’ knowledges. Critical of synthesis as both a method and a goal, such transdisciplinary work helps to recast what we consider ‘communication’ to be, casting it adrift in a sea of contingency that refuses reduction to a fixed set of practices and effects, yet, we hope, is all the more welcomed for that.